This is the second in our series, recapping the lessons learned from the Institute for Healthcare Improvement’s Reducing Avoidable Readmissions course. Care transitions are seen as key to improving readmission rates, as well as understanding that readmissions are not just the hospital’s responsibility but involve a care team that includes the patient, the patient’s caregiver, homecare, and skilled nursing, depending on where the patient is discharged. Both ensuring good care transitions to decrease readmissions, but also discharging to the right facility are crucial for lowering costs and improving care. Post-acute care shows the greatest discrepancy in costs per patient and is growing at 6% annually for Medicare patients. Today, 40% of Medicare patients discharge to a post-acute care facility, and 33% of patients in these facilities experience a care-related adverse event. By 2017, skilled nursing facilities could face penalties of up to 3% of Medicare payments for readmissions, thus there are real incentives to improve transitions, if patient safety isn’t enough to effect change. The first step in improving care transitions is to ensure that the patient is going to the right setting, and this requires a decision by the care team that includes the patient and the patent’s caregivers. If money is not an object, many hospitals discharge to skilled nursing as a way of insuring that the patient doesn’t readmit. However, if care transitions are not handled properly, this adds costs without improving quality. One of the biggest challenges in care transitions, is that there are no universally agreed upon assessment tools for determining the best next step for patients on hospital discharge, hence the over prescribing of skilled nursing. Beginning to track readmissions and outcomes should help organizations stratify risk and begin to be able to predict the best setting based on data. In addition to data, interview patients. Often missed care transitions are only identified by the patient him or herself as they are more aware of what was lost in transition. In order to facilitate better transitions, cross-functional teams need to be developed and these need to include members of the receiving facility. One skilled nursing facility reported significantly better transitions by simply placing one of their nurses in the hospital part-time to meet with patients before they were transferred. These teams must have support at two levels: the executive level must provide resources and be open to changes recommended by the functional team that handles the care transitions. Functional teams must feel empowered to change and improve processes for care. Organizations that are pursing ACO models and bundled payments were seen as great opportunities for these types of cross-organizational and cross-discipline care teams. The INTERACT tool is a way to ensure that the receiving organization gets the right patient care information during this transition. Unfortunately, given the lack of interoperability of medical systems, this approach requires additional paper work. There is no easy way to share patient records between EMRs or organizations, or sometimes within the same organization. Sending information about patient preferences. One example was given of a patient who preferred to take her medication with Coke. She was greeted at the skilled nursing facility with a Coke and her medication. In keeping with the opening statement of the course, there is no silver bullet, just a lot of practical common sense advice, and clear and timely communication. 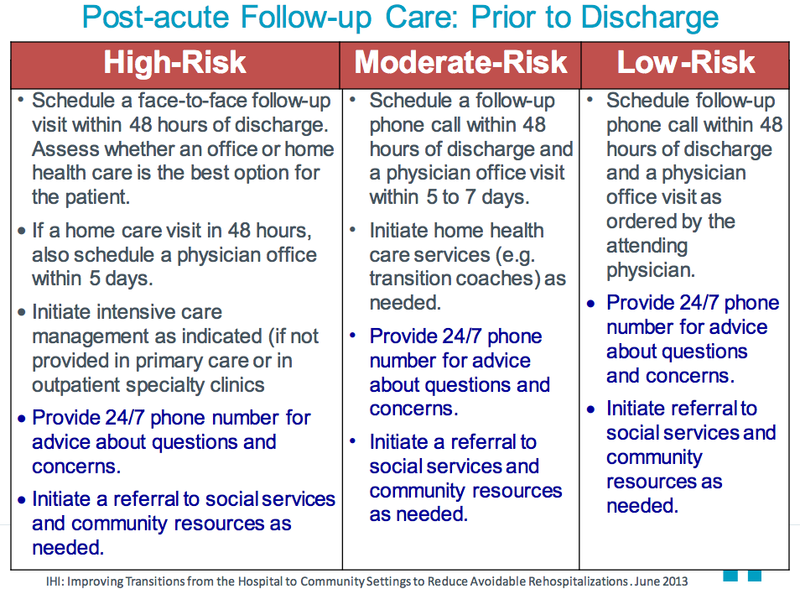 Next we’ll look at some best practices for discharging to home and the role of the primary care physician.